LASIK eye surgery is a type of refractive surgery for the correction of myopia, hyperopia, and astigmatism.LASIK (laser-assisted in situ keratomileusis) is a type of laser refractive surgery — the best known and most commonly performed. In general, a special type of cutting laser is used to precisely change the shape of your cornea — the dome-shaped transparent tissue at the front of your eye — to improve vision. Complications that result in a loss of vision are very rare. But certain side effects of LASIK eye surgery, particularly dry eyes and temporary visual disturbances, are fairly common. These usually clear up after a few weeks or months, and very few people consider them to be a long-term problem. Long-term results from LASIK tend to be best in people who are carefully evaluated before surgery to ensure that they are good candidates for the procedure. Your eye doctor will ask about your medical and surgical history and give you a comprehensive eye examination.In the eye examination, your doctor will evaluate your vision and look for signs of eye infections, inflammation, dry eyes, large eye pupils, high eye pressure and other eye-health conditions. He or she will also measure your cornea, noting the shape, contour, thickness and any irregularities. This helps your doctor assess whether you can undergo the procedure safely. Your eye doctor also evaluates which areas of your cornea need reshaping. He or she determines the precise amount of tissue to remove from your cornea. Doctors generally use wavefront-guided technology to evaluate your eye in detail before LASIK surgery. In this test, a scanner creates a highly detailed chart, similar to a topographic map, of your eye. The more detailed the measurements, the more accurate your eye doctor can be in removing corneal tissue.If you wear contact lenses, which can change the shape of your cornea, you'll need to completely stop wearing them and wear only your glasses for at least a few weeks before your evaluation and surgery. Your doctor will provide specific guidelines depending on your situation and how long you've been a contact lens wearer. LASIK surgery is usually completed in 30 minutes or less. During the procedure, you lie on your back in a reclining chair. You may be given medicine to help you relax. After numbing drops are placed in your eye, your doctor uses an instrument to hold your eyelids open. A suction ring placed on your eye just before cutting the corneal flap may cause a feeling of pressure, and your vision may dim a little.Your eye surgeon uses a small blade or cutting laser to cut a small hinged flap away from the front of your eye. 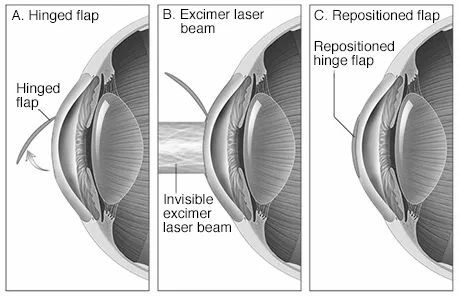 Folding back the flap allows your doctor to access the part of your cornea to be reshaped.Using a programmed laser, your eye surgeon reshapes parts of your cornea. With each pulse of the laser beam, a tiny amount of corneal tissue is removed. After reshaping the cornea, the surgeon lays the flap back into place. The flap usually heals without stitches.During the surgery, you'll be asked to focus on a point of light. Staring at this light helps you keep your eye fixed while the laser reshapes your cornea. You may detect a distinct odor as the laser removes your corneal tissue. Some people describe smelling an odor similar to that of burning hair.